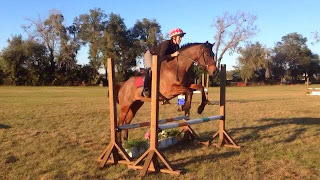 Redbud Farm Equestrian: our little man all 'growed' up! our little man all 'growed' up! 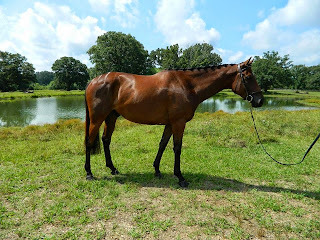 We bought Harrison as an un-cut yearling from the Louisiana Thoroughbred sale because Betsy thought he looked so sweet. I gave her a hard time because he was just a little guy and she did not need any more ponies! Early on he kicked the crap out of Betsy's hand and we quickly gelded him. However, he was a little monster. He wouldn't tie. He wouldn't let us pull his mane. AND he a had quite a 'tude'. The first time we put a saddle on him he bronced and bucked with the best of them. 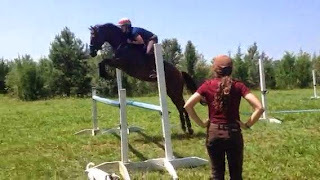 The first time we lunged him in tack outside the round pen, he got mad and threw himself over backwards only to discover that wouldn't get him out of work; it only brought on what I can only imagine was a pretty serious body ache. 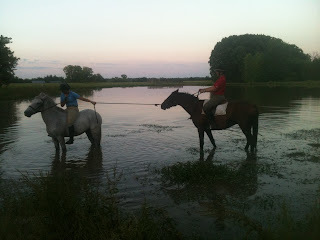 The first time we sat on him we decided to do it in the pond. According to Bill that's how the Indians break their horses. That way its harder to be naughty! Then he came Florida and grew up some. Now I hardly recognize him. And MAN can that little sucker jump! We're so excited for Megill Imes to be taking him to his first recognized event in a couple weeks at Chatt Hills. They're going to be stars! redbud farm equestrian, llc 2011. Powered by Blogger.